In what are known as two-tier Local Government areas your CT will be shared out in varying amounts between the County Council, the District or Borough Council, the Police Authority, the Fire & Rescue Authority and, if you have one, your Town or Parish Council. In Local Government jargon, the amount paid to each of these bodies is known as a precept. 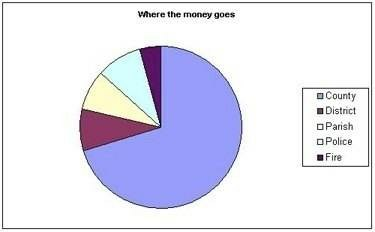 Figure 1 shows a typical example of how the money is divided up in most places in the country. Note: If you live in an area with a single tier of local government i.e. a Unitary or a Metropolitan Authority, or if you live in London, fewer bodies share the money. In a few places, the Fire Service charge is included in the County charge. With a few exceptions, there are usually no Town or Parish Councils in a single tier Authority. Each body sets its own precept every year and the total of all the precepts determines how much your total CT bill will be. The District/Borough Council is responsible for collecting all the tax and then distributing it to the others. Due to there having been some horrendous increases in CT in recent years, and in an attempt to limit the increases in the individual precepts, the Government now specifies a maximum percentage increase that can be applied. This is known as a cap. Currently (2008), the cap is 5% and applies to the precepts demanded by each body with the exception of Town and Parish Councils! This means that Town and Parish Councils can increase their precepts by whatever percentage they wish. Being well aware that the cap does not apply to Towns and Parishes, a growing number of District Councils are offloading some of their non-statutory duties onto Towns and Parishes in their area but keeping the money that they would have had to spend on these duties. This has resulted in many Town and Parish precepts rocketing and, in a growing number of cases now being as much or even more than the precepts demanded by the District or Borough Council. In a growing number of places these uncapped increases add considerably to the total increase in the CT bill, and push the total increase to over the 5% limit: 6%, 7% or even more. "..there are a few towns and parishes where the parish precept is larger than the council tax due to the district council. In these cases, it is illogical that taxpayers should have protection via the Government’s reserve capping powers from excessive council tax increases made by the district, but no protection from excessive increases in the [parish] precept." The problem was also recognised in a Department for Communities and Local Government (DCLG) document issued in March 2007 where it stated: "Parish precepts in 2007-08 will total £299 million. This represents an increase of 6.7% over the 2006-07 figure of £280 million." The chart below shows just one example of how the Parish precept for one village in Hampshire has increased over the years. Successive Government Ministers have done nothing to correct this non-capping anomaly. Indeed, when Phil Woolas was the Local Government Minister, the Is It Fair council tax protest group asked him about this and he responded by stating that the Government had no plans to cap Town or Parish precepts. And so it has been. Nothing has changed since Woolas made that statement and, through its inaction, the Government has continued, tacitly, to support this underhand way of getting around the 5% cap. The result? More and more non-statutory functions (but not the funds to finance them) are being off-loaded on to Towns and Parishes. Towns and Parishes cannot be forced to take on these extra responsibilities but some do, possibly unaware of the financial implications. Either way, it seems that many of the Districts keep the cash that they had previously been spending on the transferred functions, still increase their precept by just under the 5% cap, and the Town/Parish (i.e. the Town/Parish residents) pay again for the cost of the transferred services through huge increases in their local precepts. Most Council Tax payers will consider it inefficient and wasteful to have to fund multiple tiers of local government, especially when one is not restrained by the government imposed cap. Fortunately, it is relatively simple to close this loop hole and so avoid excessive precept hikes in the future. Abolish the Town or Parish Council. Legislation already exists to abolish Town and Parish Councils through a Town/Parish Council Review. A Poll can be demanded in accordance with the Local Government Act 1972, Schedule 12, if not less than 10 or 1/3 of the Local Government Electors present at the Annual Parish meeting, whichever is the less, demand such a poll. This year's Annual Parish meeting will take place in April. 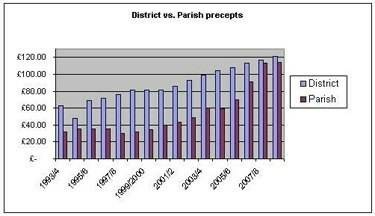 The Joint Parish Council's Precept is expected to increase by 30% for 2009/10. This increase is required to pay for a budgeted increase of 18% for 'Personnel Costs' as the Parish Clerk's hours have been increased by 66% and a 228% increase in JPC's PR budget, which is called 'Communications with the Community'. Wellesbourne Parish Council has announced a 22% reduction in its precept for 2009/2010. In our last edition, we reported that the Stratford-on-Avon District Council’s Cabinet agreed to recommend an increase of 4.9% in Stratford District Council’s portion of the Council Tax for 2009/2010. Comments made at the JPC Council meeting on 19th January that the Town Improvement Committee (TIC) was no longer sponsoring the Henley Gateway website have proved to be incorrect. The TIC has had the pleasure of sponsoring the Gateway Site for several years. It was the original view of the TIC that the Gateway Site was a valuable contribution to the information facilities leading to information about Henley-in-Arden. We have watched with interest the development of the site and the links that have been added to many of the bodies and organisations operating within the town. Our original view has proved justified and we wish the Gateway Site every fortune in its future role. Although the TIC has had no editorial input into the site we are delighted to maintain a watching brief over our sponsorship, and I can confirm that there has never been any criticism of the Site raised by any member of the TIC at any meeting of the TIC. Accordingly we are delighted to continue our sponsorship of the Site. 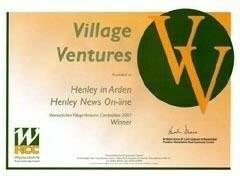 As you know the sponsorship does not involve any financial contribution to the Site, but does include the recommendation of the site to the users, both actual and potential, as a valuable introduction to information regarding many aspects of life in Henley-in-Arden. Nicholas Haycock was co-opted on to the Joint Parish Council in January 2009 in succession to Laurence Marshall who stood down from the JPC but remains a District Councillor. Nicholas is a well known member of the community and has been working as a surveyor, valuer and estate agent in Henley in Arden for nearly 40 years. 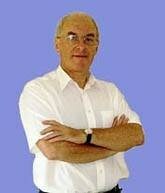 He started as a trainee with the late Tony Earle in August 1969 and qualified as a Chartered Surveyor in 1973. Since 1992 he has been running his own practice now based in the town centre. 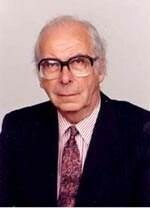 He was educated at Cedarhurst School, Solihull and Leamington College for Boys. Nicholas arrived in Henley-in-Arden three weeks after leaving school! He finally moved to Henley in 2004 following the sale of the family farm at Fen End. He has three grown up children, a granddaughter Grace and acquired two step-daughters on remarrying in 2006. 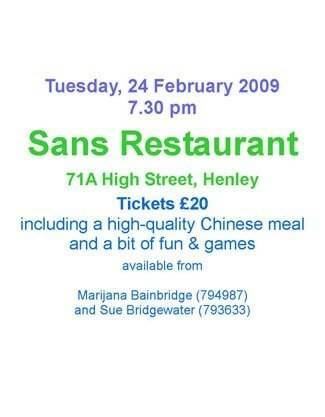 Nicholas has always been a great supporter of Henley-in-Arden, its societies and organisations and was Chairman of the Sports and Social and Cricket Clubs back in the 1990s. He lists pretty much all other sports as his main interest, also gardening and the ‘allotment’, together with the countryside and wildlife. Henley NEWS On-line's Chief Photographer, John Love, has been out this week to photograph the snow on the High Street and the Riverlands. For the photographic experts, John has joined together several photos to create these panoramic scenes. 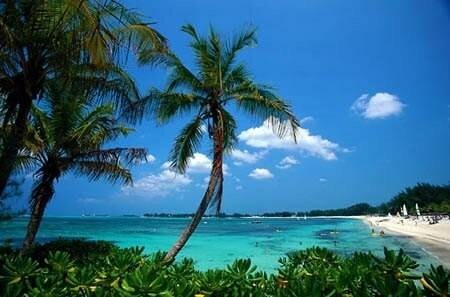 It is warm and pleasant here, as you would expect in these stress free islands. We do however, face a daily barrage of jokes from other North Europeans and North Americans regarding the inability of our country to operate whenever we have what the BBC now calls “snow events”. In the digital age, the whole world can enjoy laughing at the incompetence of our formerly great nation, and to make things worse, the ludicrous description invented by our internationally respected broadcasting body. In addition, the local people, who are used to dealing with occasional adverse weather conditions such as hurricanes, enjoy mocking their erstwhile Imperial masters, as the U.K is seen to be effectively closed down by a relatively light snowfall. International TV news shows other countries coping with deluges of 30 plus inches and yet, in our reduced circumstances, we appear as ill equipped as any Banana Republic. Only when in a truly international place such as this, can you appreciate that the United Kingdom is viewed as a “basket case” by so many. Fortunately, by evening, the rum cocktails have taken the edge off the banter but who would have thought that we would ever be subject to “English jokes” !! I shall continue to do my utmost to endure the ignominy and enjoy a few weeks in the company of Bahamians who never worry about anything at all. As an illustration of just how relaxed life can be, the local golf club has no dress code whatsoever and is so informal that the club champion is known only as Bumper and the handicap secretary responds only to Gizmo. I do hope that all our friends in Henley manage to get about their daily business despite the snow and ice, but meanwhile I am off to play a round of golf with Bouncer, Bumper and Gizmo. The Joint Parish Council meeting on Monday 2nd February was postponed at short notice because of the snow event. It will now take place on Monday 9th February. Rob Walsh, Head of Community Service at Stratford District Council is scheduled to speak at the Parish Council meeting on Monday 16th February at 7 pm in the Baptist Church Hall regarding the provision of CCTV cameras in Henley. Henley NEWS On-line recommends all its readers should attend this meeting. The service has been suspended today (Thursday 5th February) due to the weather conditions. Collections will recommence as soon as conditions allow. I will update you as soon as I have more information. Warwickshire Lawn Tennis Association held their Annual Awards Evening at the Birmingham Botanical Gardens on 23rd January. Henley in Arden Tennis Club Chairman Judy Wilde was awarded "Volunteer of the Year" in recognition of her dedication and hard work for the club. She has worked tirelessly towards the completion of the refurbishments of four of the seven courts (two Astro turfed and two re-surfaced), as well as everyday club business. Leanne Supperstone received the Coach of the Year award and Rugby Tennis Club was awarded Club of the Year. An 88 year old lady wrote this letter to her bank. The bank manager thought it amusing enough to have it published in The Times and the newspaper thanked him most sincerely. By my calculations, three 'nanoseconds' must have elapsed between his presenting the cheque and the arrival in my account of the funds needed to honour it. I refer, of course, to the automatic monthly deposit of my pension, an arrangement which, I admit, has been in place for only eight years. You are to be commended for seizing that brief window of opportunity, and also for debiting my account £30 by way of penalty for the inconvenience caused to your bank. I noticed that whereas I personally attend to your telephone calls and letters, when I try to contact you, I am confronted by the impersonal, overcharging, re-recorded, faceless entity which your bank has become. From now on, I, like you, choose only to deal with a flesh-and-blood person. My mortgage and loan payments will therefore and hereafter no longer be automatic, but will arrive at your bank by cheque, addressed personally and confidentially to an employee at your bank whom you must nominate. In due course, I will issue your employee with PIN number which he/she must quote in dealings with me. I regret that it cannot be shorter than 28 digits but, again, I have modeled it on the number of button presses required of me to access my account balance on your phone bank service. To make a general complaint or inquiry, the contact will then be put on hold, pending the attention of my automated answering service. While this may, on occasion, involve a lengthy wait, uplifting (actually tedious) music will play for the duration of the call. IMPORTANT to REMEMBER that this letter was written by a lady of 88; DOESN'T SHE MAKE YOU PROUD!!!? British Gas has announced that it is cutting prices for its customers this winter by ten per cent but David Wilson Mercia is going much further and effectively cutting them by 100 per cent. The homebuilder is offering to pay 100 per cent of the gas bill for the next 18 months for anyone buying a property at its developments in Warwickshire. David Wilson will also pay 100 per cent of your electricity bill, 100 per cent of your water bill and 100 per cent of your council tax. You could save literally thousands of pounds on bills over the next year and a half – which would make a new David Wilson home as affordable as it’s been in a generation. Henley Point homes are currently available with stamp duty, legal fees and moving costs paid. 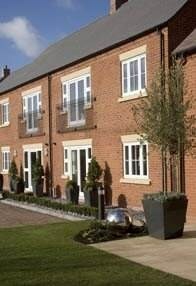 Henley Point offers one-bedroom coach houses, one- and two-bedroom apartments and three- and four-bedroom houses, with prices starting from £159,000. The sales office is open Wednesday to Sunday from 10am to 5pm. You will recall that the government likes to update employment regulations in April each year. You might think it’s a bit early for me to be writing about these now but it’s as well to start preparing. Possibly the most significant changes for small employers are the new wage and disciplinary procedures which have recently been announced. The Employment Act 2008 was passed back in November 2008 and a number of changes it introduced will come into force this coming April. There will be changes to the enforcement of the National Minimum Wage (which you will recall is reviewed each October). There will be a new penalty for employers who pay their employees less than the minimum wage and a method of calculation of arrears based on the length of time they have been doing this. Workers will be entitled to have arrears of wages repaid at current rates. There will also be a repeal of the statutory dismissal and disciplinary procedures contained in the Employment Act 2002 and the dismissal rules in the Employment Rights Act 1996 that have now been ruled unfair. Employment Tribunals will also be able to increase or reduce awards by up to 25% where an employer or employee unreasonably fails to comply with the new ACAS revised code of practice. You can read the draft proposal if you have time by clicking here. Don’t worry, it’s only 74 pages! Before the new Employment Act becomes law in April 2009 employers should review their disciplinary and grievance procedures (you do have these, don’t you?) so they are compatible with the new law. That’s why I’m reminding you now! While writing these articles last year I produced a short, easy to use, electronic guide to the rules and regulation of employing people called the Small Business Guide to Employment 2008. I will be updating this in April. As the current guide is only valid until March this year I am happy to offer a copy free of charge to anyone who would like one. It’s in PDF format and you can download it from my website at www.garnerharris.com. Just save it to your desktop and it’s always there when you need it. 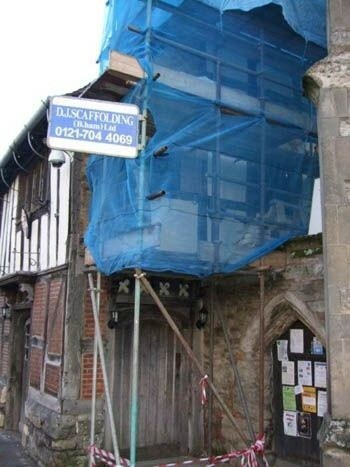 Many of you must have noticed, as you shopped in the High Street, that scaffolding has been erected at the south facing gable end of the Guild Hall. Basically, it has been erected in order that essential repair work can be completed on the brick and wood-framed wall. The work is being carried out, not, I might add, by any Italian and Portuguese workers, but by local builder John Clayton. While on site, John’s firm is also completing a number of other works that will go part of the way to securing the ground floor of the building against flooding. If you remember in ‘The Great Flood of July ‘07’ the ground floor of the Guild Hall was badly flooded. The flood put the town’s library out of action for many months, and caused the book-worms of Henley, not to mention the lack of internet access for the geeks, under a considerable intellectual strain. Naturally, the Guild Hall Trust does not want this inconvenience to the town to happen again. So, these repairs will be only the first stage of the flood protection programme, as further work needs to be done to secure the building against any future rise in river water levels. All this necessary work is expensive, and comes at a cost to the revenues of The Trust. It is The Trust’s responsibility to maintain the Guild Hall for the town, not only for the present generation of citizens, but also for future generations to enjoy. Here, I think I need to remind Henley’s citizens, and contrary to many people’s thinking, that the Guild Hall is funded through the local council tax.. Let me tell you, that it is not! The Trust has to raise the majority of its funding in the commercial world, i.e. leasing the ground floor of the building as office space. However, we do have charitable status, and a valuable band of volunteers that work tirelessly to keep the building, its gardens and historical traditions at the ‘Heart of Henley Life’. I was cutting through HSBC's car-park between Station Road and Henley High Street because the pavement from there on is a skid-slope with last years rotting leaves. Eyeing the posh cars parked there I thought to myself 'This neglected little patch needs a touch of TLC'. However, walking down the steps and along the passageway, my opinion sank even lower. Littered with cans, cigarette stubs and grime, it hasn't been swept for years - and with all that money sloshing about too you'd think they could spare a few quid to have it cleaned up! It must have been dustbin day, or re-cycling weekend; then again, perhaps not, but it struck me that some wheeley bins spend more time left outside where we can see them than they do put away and out of sight. They really are a godsend but don't some of us wish we could beam them up between collection days. An easy way to find out about your home’s energy use? Ask a local estate agent to survey your home for an Energy Performance Certificate. From April 6th this year, you will have to have available a home information pack (HIP) before you put a property up for sale. The pack contains various technical details about the property including its legal title and its energy efficiency. The latter is covered by the Energy Performance Certificate; a 6 page document detailing the energy performance and associated annual costs. It also gives the ultimate potential of the property in terms of energy, costs and CO2 if all recommended cost effective energy saving measures are put in place. Examples of three of the charts from a certificate for a hypothetical but fairly typical property are shown right. 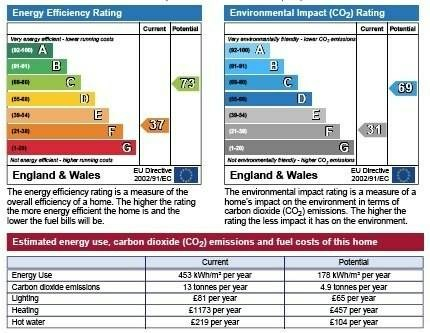 If you are unsure about the energy efficiency of your home, you can get an assessment and certificate for roughly £50 to £90 depending on the size of your property. Contact a local estate agent. They will arrange an appointment to come and gather the information and measurements needed to work out the energy efficiency rating and provide a certificate/ report. As an alternative, you can contact the Warwickshire Energy Efficiency Advice Centre by calling 01789 842898 for free friendly and impartial advice about improving the energy efficiency of your home. This is not detailed like the Energy Performance Certificate but it is free; the choice is yours. February is national Scams Awareness Month and Warwickshire Trading Standards Service wants to hear from members of the public and businesses that have been the target of a scam. Warwickshire Trading Standards Service is working in partnership with the Office of Fair Trading to raise awareness of the many scams that are targeted at people of all ages and backgrounds. In the last few months Warwickshire Trading Standards Service has received over 250 complaints from Warwickshire residents and businesses who have received some sort of scam letter, email or telephone call. From bogus foreign lotteries and phishing emails to miracle cures and mock business advertising there are many ways in which these criminal gangs are trying to get your money. In these tough economic times scammers are becoming more sophisticated in the ways in which they obtain information, personal details and money from people. Victims can be targeted in a number of ways; telephone, letter, email or classified adverts – and be aware, everyone and anyone is the potential victim of these scammers. Warwickshire residents are being encouraged to take part in “Scamnesty”. From 2nd February until 16th February Warwickshire Trading Standards Service want people to send in any potential scam letters/mailings they have received. Trading standards are also keen to receive information of phising emails and potential scam telephone calls. This information will be recorded and used to investigate the scale of the problem both in Warwickshire and across the country. Warwickshire County Councillor Richard Hobbs, Portfolio Holder for Community Protection says “Often it is the elderly and vulnerable that are preyed upon but email phising scams and scams targeted at businesses are increasing. By launching this campaign, we want to raise awareness across the county about the different methods scammers use and provide advice and guidance to people". Tuesday 27th January 7.45 pm at Ullenhall Village Hall. Please note change of speaker: Linda Smith will talk to us about “Bog Gardens for Moisture Loving Plants”. Visitors (£2) and new members always welcome. Go bananas for Fairtrade! Join us on Saturday 7th March 10.00 – 12 noon outside St. John’s to help the international attempt to break the world record for Fairtrade banana eating! Supplies of Fairtrade bananas will be available but you can also purchase your own that week from Henley Somerfield. There will be a Traidcraft stall with Fairtrade produce and information outside St. John’s on Wednesday 25th February and Saturday 7th March. On Wednesday 18th February Henley WI invite you to support Fairtrade at their “Souper Lunch” from 12.30 to 2.00pm when they are serving soup, crusty bread and tea or coffee for £2 in the Baptist Church Hall. Cakes will be available to buy as well as grocery items on a Traidcraft stall. All proceeds to Fairtrade. HENLEY WI will welcome visitors to our meeting on Tuesday 3rd February in the Memorial Hall from 7.30 pm when our speaker is Fay Palmer who will tell us about “Dowsing for Health”. We have lots of opportunities for learning new skills and for meeting socially. HENLEY IN BLOOM is holding its Annual General Meeting on Friday 6th February 7.00pm at the Baptist Church Hall. All welcome. 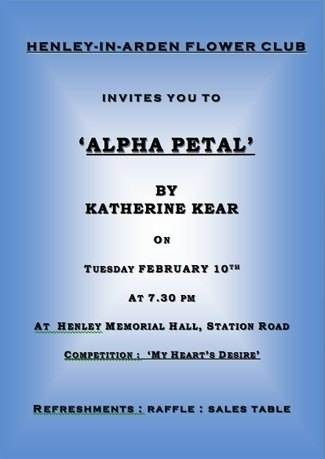 Tuesday 10th February, 7.30 pm at the Memorial Hall when our speaker is Katherine Kear “Alpha Petal”. Competition “My Heart’s Desire”. Thursday 19th February, 8.00 pm Baptist Church Hall. 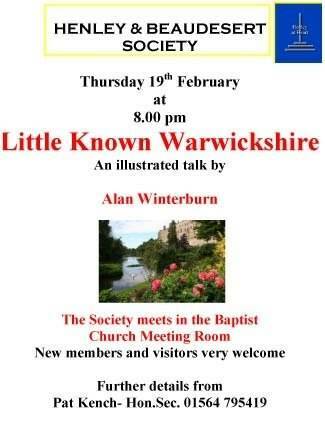 Out speaker is Alan Winterburn on “Little Known Warwickshire”. Visitors and new members are very welcome. Further details from Pat Kench on 795419. Brian Draper OBE makes a welcome return to our meeting on Tuesday 17th February when he will speak about the “River Stour (Worcestershire)”. 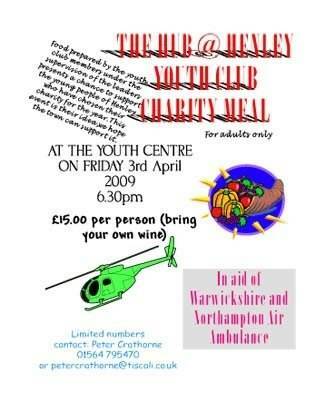 Visitors are welcome to join us in the Baptist Church Hall from 7.45 pm – only £2. Tuesday 24th February 7.45 for 8.00 pm in Ullenhall Village Hall. Our speaker is Andrew Ward (Nurseryman) who will talk about “Woodland Gems”. There will be a plant stall and visitors (£2) and new members always welcome. Meetings are held on the first Wednesday of the month in the Parish Hall, Beaudesert Lane at 2.15 pm The Club has around 80 members and organises a varied programme together with various outings. If you are interested in joining, please contact Gordon Trinder. Welcomes players who may be interested in joining the club. Club nights are Friday and Sunday from 8.00 pm in the Memorial Hall. Further details: Chairman 793320. Visitors welcome (£2). Plays Duplicate Bridge of intermediate standard on Tuesday evenings at the the White Swan Hotel and usually find time for a tipple, which may or may not improve our play!! Play commences at 7.15 promptly. There are normally 5 - 8 tables and the club does not issue master points.